Tell me what kind of bass fishing tackle you have. If you don’t have the BEST bass fishing lure in your tackle box, YOU ARE WRONG! Now you are asking, “What is the best bass fishing lure?” I will tell you later. There are so many rods to choose from. A bass fishing rod can have many different characteristics. I would say there is no exact choice for every situation. I will give you a few options to think about. When you hold your rod and reel in your hand it should feel natural and comfortable. That is why it is so important to fit the right reel with the right rod. It’s all about feel and balance. There have been a few improvements to bass fishing reels in the last few years. That means there has been an overall improvement to your bass fishing tackle. We will talk about each type of reel and give you some options to think about. 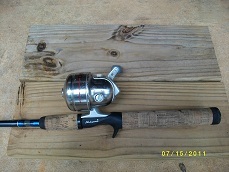 But I will tell you right now I use a spin cast reel with a medium action 6 foot rod. Maybe you are asking why I use that combo! This combo is versatile and it feels good in my hand. But I am always looking to learn and improve on all my bass fishing tackle. Choosing the right bass fishing line is just as important as choosing the right rod and reel combo! But this is for certain-One line does not perform well in all situations! I will talk about each of these to give you some ideas and options. Also does anybody out there know how to tie fishing knots? And what are your best bass fishing lures? Ok now, did you go look in your tackle box? Do you have any plastic worms in there? Do you have one hanging off the end of your rod? If you don’t then let’s go get some! Yep, in my book plastic worms are the best bass fishing lures out there! So take a look inside my tackle box below and see what lures I have to catch bass.